Most of my poetry doesn’t get to see the daylight as it’s just for me to release what’s going on in my head but in some cases, the frustration is just too much and I have to share it. you’re TOO OLD FOR THAT! dating a 30 year old? why would you dye your hair blue! I have dyed my hair the other day – I went from silver to pastel pink. I know what most people are thinking – she’s almost 40, she’s in a professional job, she can’t be taken seriously looking line this! and most of all… she’s too old for that! Do you know what my response is? – Give me a break!!! If you want to dye your hair – do it! If you love someone younger (or older) – so what!?! Love them!!! Wear what you want to wear! – long or short; tight or not; colourful or black. We have only one life and I think that at the end of our way we’d want to be able to say that we actually made the best of it. so… as long as you’re not hurting anyone – Be happy! Be fulfilled! and BE YOURSELF! …because you’re NEVER TOO OLD FOR THAT! As the art journal, I used an old book called ‘Stories for girls’ (yeah, I know… talking about feminism…). Various number stencils from A.B. Studio were the perfect choice for this design. Colours are as usual Tattered Angels. I’ve been in a bit of dark mood recently and this is the fruit of my crafty darkness… I wanted to utilise some of my beloved Canvas Corp Brands products but with, hopefully, a bit more grungy outcome.. 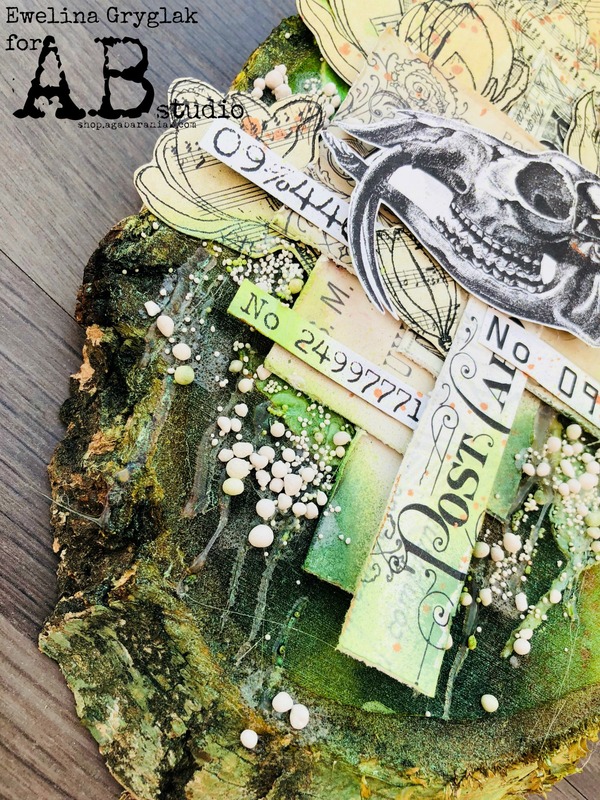 Using Canvas Corp Printed Cardboard as a base, I played with Tattered Angels Naturally Aged kit – Peeled Paint. It created a very textured look with the original cardboard circle prints showing underneath. I totally love the effect!!! In the process, the paint bubbled so I rubbed it off uncovering the layers underneath – another bonus! 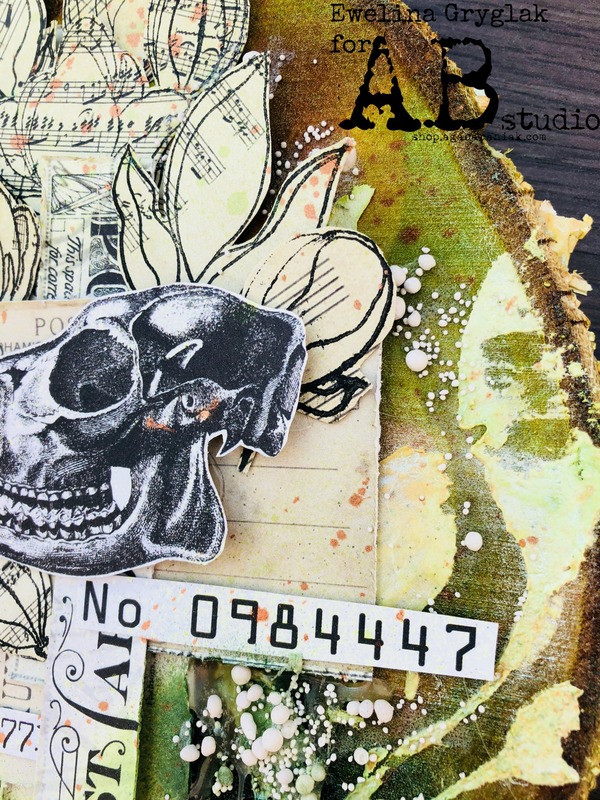 To add even more texture, I embossed various background stamps. As a base for the ‘face’, Architextures Short Base Wings were in perfect contrast with the darkness of the rest of the layout. The MDF wings were coloured with Tattered Angels Colour Wash; so was the face. As the final touch, I mixed some deco stones with Glimmer Glaze and spilled it around the wings. Can you see that texture?!?!?! Let me tell you – DesignIt paste from Colourcraft UK is amazing! I put it into a lace mould (one for cake decorating), gave it a couple of hours to dry and… a detailed, flexible lace came out! All the colours are Metallic Aztec Paints by Colourcraft C&A Ltd – the project can out so much better than expected. Make sure to stop by the Colourcraft C&A Ltd and get some of the amazing products! A crafty friend of mine, Mark Gould, is an extremely talented man. He’s an accomplished mixed media teacher who has recently released his own stamps. I couldn’t resist and purchased one of them, called ‘Gypsy Rose’. To colour the stamp, I used Brusho powders. They have also been used to create the background on the canvas. To make this page, I used Canvas Corp Printed Cardboard – I love the texture and versatility of it. And it doesn’t warp with wet media! Total win, if you ask me. Read More "Lady in Green"